Warner Brothers got back to its muckraking roots in this somber drama about an "outsider" who witnesses a Klan murder in a small town and is persuaded to keep quiet about it because her sister's scummy husband is involved in it. One of the aspects of this film that I appreciated was that the Klansmen aren't pawned off as buffoonish, mouth-breathing cretins as they often are in films like this (although Steve Cochran as Doris Day's white-trash husband comes close), which tends to trivialize them and make them seem a bit less dangerous than they really are. 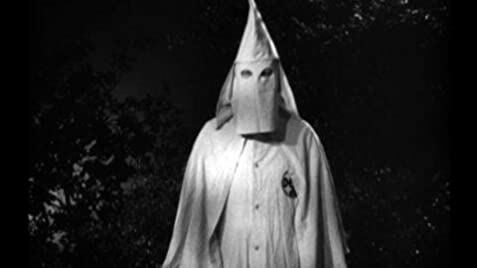 The film shows the people who run the Klan to be fairly prominent local citizens--which is, unfortunately, often the case in real life with organizations like the Klan--which actually makes them far more dangerous than if they were just a semi-literate bunch of backwoods hillbillies. Doris Day gives a bravura performance in her first dramatic role; she tends to just skirt the edge of "going over the top" on a few occasions, but director Stuart Heisler skillfully brings her, and the rest of the picture, under control, and it does have the gritty, noir-ish look reminiscent of the great Warners films of the '30s and '40s. Ginger Rogers is very good as Day's visiting sister who realizes the type of dilemma her sibling is caught in, and Ronald Reagan turns in one of his best performances as the local District Attorney who knows that Rogers saw the murder and needs her to testify in order to bring down the local Klan organization, which he is determined to do. At a time when the government was far more interested in ferreting out "Communists"--who it was convinced were the driving forces behind the burgeoning civil rights movement--than it was in eliminating far more dangerous menaces like the Klan, it took guts for Warners to come out with a film like this. The movie actually was condemned as "Communist propaganda" by various right-wing groups, a charge Warners was used to by this time, and the studio courageously stood behind the film. Day, Rogers, Reagan, even Steve Cochran are at the top of their form here. A previous poster has called this a "forgotten gem", and he hit the nail right on the head. This is a first-rate film that isn't as well known as it should be, and is most definitely worth a look. The studio wanted Lauren Bacall and Doris Day to star in the film, but Bacall went to Africa with her husband Humphrey Bogart to film The African Queen (1951). Ginger Roger's character gets whipped in the right shoulder during the whipping scene. After she is saved, she is seen rubbing her left shoulder as if it had been whipped.